Women's hard labour in agriculture is often unrecognised. Shahana and Jaygun, two different women who are different in all respects, come from two different places, have different backgrounds and have two different stories to tell. Shahana, a housewife with a Master's degree living in Dhaka, has been married for 10 years, and does not find time to hold a job as she is burdened with domestic responsibilities such as bringing up her children and doing household chores, and a lot more. 'Housewife' Shahana does not even get time for herself as she is too busy doing all the household work. Another story is Jaygun's, who is a domestic worker in a village and also a seasonal labourer during harvest. As Jaygun's family has a piece of cropland that provides paddy for their livelihood, she, being the head of the family (she is a divorcee) is obligated with many responsibilities. 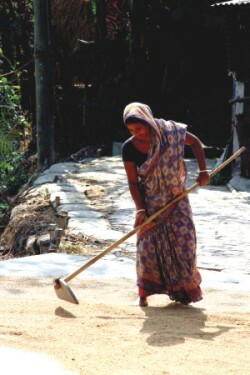 This ranges from sowing seeds to serving the food to her family. Going beyond all the dissimilarities, Jaygun and Shahana are common in one aspect, their labour is unrecognised. Shahana and Jaygun's tales represent the trend of how a woman's labour in family and agricultural and other sectors is not recognised let alone be evaluated. Research shows that 72 percent women in the country are giving their labour without receiving any money. 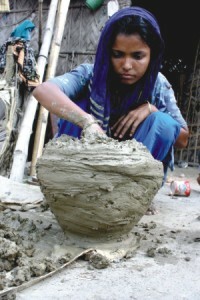 Eighty-one percent of women labourers are contributing directly to household work. Shahana's labour is a must for her family and definitely saves a lot of money for the family as she does not have to hire people from outside for getting those tasks done. And Jaygun's hard work for growing paddy almost equals to works done by the male members (her son and brother) of her family, who are recognised as farm hands or farmers. “I cultivate my own land, and arrange food for my family”, says Jaygun, a proud peasant who grows crops for survival. But seen from the perspective of economics, there must be a cost of this labour which might have a huge impact on the country's Gross Domestic Product. They are giving the labour for free and the unclaimed cost of their labour remains invisible, thus making the whole process of development one-sided. According to the labour force survey 2004-2005, some 77 percent of the total female labourers are rural women who are involved in agricultural works, fisheries, and poultry farming. And the number of female workers has increased from 37 lakh to 77 lakh (which is a 108 percent rise) in agriculture, forestry and fisheries sectors in the period from 1999-2000 to 2005-2006. In the same time span, the number of male workers has increased to 2.3 percent only in the mentioned sectors. Household work is never evaluated. As the country's economy has experienced a massive change in the last decade, it has an impact on the gender dimension of labour involved in agricultural and industrial sectors. According to government statistics mentioned in a study on female workers' involvement in agriculture, contribution of male labour in agriculture, forestry and fisheries decreased by 10.4 percent in 2002-2003. But female labour experienced an increase in those sectors. On the other hand female participation decreased by 6.7 percent in industrial production between 2000 and 2006. The study was conducted by Sharmind Neelormi, professor of Economics, Jahangirnagar University along with Ahsan Uddin Ahmed, executive director of Centre for Global Change and coordinator of Oxfam's (a non-government organisation) Campaign for Sustainable Rural Livelihoods (CSRL). Male labourers are shifting to different sectors other than agriculture, creating a gap which then is filled up by female labourers; the whole context confirms the soaring involvement of female labourers in rural development, observes Sharmind Neelormi. Neelormi lauded the initiative of the government to encourage the peasants by providing them with cards which will facilitate subsidy for them in collecting diesel and fertiliser. A total of 88,000 cards have already been distributed among the farmers. “But such cards should not be distributed only among the male farmers as the number of female farmers too has risen to a great extent. A number of cards should be distributed among female farmers who usually head their families in absence of their husbands. But that is too little to be mentioned,” continues Neelormi. “If the government provides such female headed families a card that would be a step ahead towards recognising female labour in agriculture,” says Neelormi. Neelormi also says, “Apart from the rural female labourers, there are women who work hard for their family in urban and peri-urban areas; the question of paying for their service does not arise at all when their labour is not even recognised. The government can take initiative to recognise women's contribution to their family by institutionalising all sorts of domestic work”. There is a method of accounting domestic labour practiced in different countries set by the United Nations (UN) which is called the UN System of National Accounting (UNSNA), where domestic work is also counted by a satellite counting system besides the national accounting which gets budgetary allocation. And such accounting of domestic labour, mostly provided by women in a country like ours, would recognise women's contribution which can be a huge step against gender discrimination, explains Neelormi.